The heat around here is oppressive. I envy folx who live in more moderate climates. I grew up in the Northwest, and I'm much more comfortable in the rain and the cool. People around here tell me it helps you cool off to drink something hot. Ha. I don't know what alternative reality they're living in. I need something cool to drink in the afternoons, and it's really putting a crimp in my afternoon tea ritual! One of these days I'll take the time to make myself a pitcher of really good iced tea. In the meantime, I'm having an afternoon espresso, summer cooler style. No, not with coffee ice cubes. That'll come soon though. Today I just did the easiest thing. 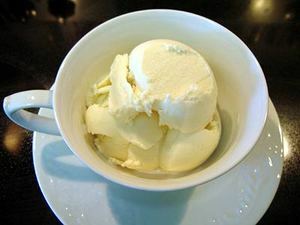 A teaspoon of almond syrup and a large scoop of vanilla ice cream in a cup. Add coffee. Et voila! 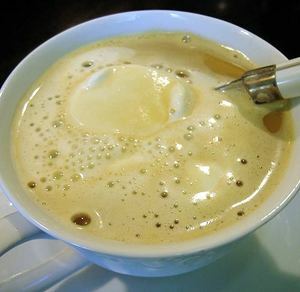 Instant summer coffee cooler. Not too fancy but it's all I have time for right now. The only thing that would make this better would be a larger cup and more ice cream!! Heh. I guess I'll just have to go back for seconds. LOL, D-Oliver, you want MOOOOORE? Fortunately I'm not the Bumble. Beedle. Whatever... you can certainly have more in my house. Thanks for the nice comments everybunny! Great to see you back, Christine! (Was beginning to be a tad concerned... ) And with something I need this time of year! "Please... [plaintive, waifish look] may I have more?" Glad you are back, and with another tasty way to drink coffee. I'd like to try this one later. It is prety good to have a cool drink in the summer afternoon. A picture is worth a thousand words! That looks so good.